Erect, annual to biennial herb, with a thick, centre stem that can grow 1-2 metres tall. Leaves are very frilly, deeply-indented and armed on the margins with extremely prickly, yellow spines. 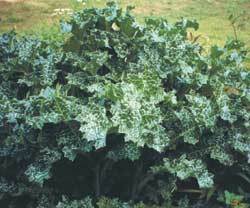 Another eye catching feature of the leaves, is the variegated markings in dark-green with thick, white veins, which look mottled or even marbled. This quite stunning, colourful leaf display of large patches of blotchy-white on the green leaves, gave man in early AD, the reason for creating a colourful folk legend, about the plant. The legend says, that as the Virgin Mary was feeding baby Jesus, some of her milk dropped on the thistle near her feet, which produced the white ‘spilt-milk’ effect, which has distinguished this herb ever since and as a consequence it has been a revered herb, receiving the many common names, listed above. Early recorded history tells us milk thistle had a long tradition of use in folk medicine, as a liver herb. The liver could be called the hardest working organ of our body, with many vital functions to perform, and because of our toxic laden food and environment, it may become an over-loaded swamp of poisons. From 1940-1970 numerous research projects confirmed the plant’s remarkable ability to assist the liver in repair, and also to protect from the detriment of alcohol, drugs, toxic foods, heavy metals, and chemicals. Scientific studies show the active components of the flavones in the herb, have unique properties that can neutralize free radical attacks in the body. The therapeutic effects can include antibacterial, antiviral, anti-inflammatory, antiallergic and vasodilatory activities. The herb is said to complement, extend, and sometimes synergise the antioxidant activities of carotenoids, vitamins C and E, which can have a profound action in reducing cancer risk. Silybin in the herb is steroidal, and has been found to activate the synthesis of new DNA and RNA.